Cuprosklodowskite is a secondary uranium mineral formed by alteration of earlier uranium minerals. Its empirical formula is Cu(UO2)2(HSiO4)2·6(H2O). 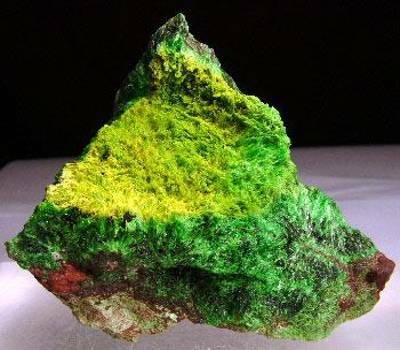 It is a rare uranium mineral that formed from the oxidation of copper and uranium-bearing minerals. It is a triclinic-pinacoidal mineral containing copper, hydrogen, oxygen, silicon, and uranium. Cuprosklodowskite was discovered in 1933 at the Kalongwe deposit in (then) Katanga province, Belgian Congo, the type locality. It was named in the mistaken belief that the mineral was the copper analogue of sklodowskite, which in turn was named for Marie Curie (née Maria Sklodowska) (1867–1934). 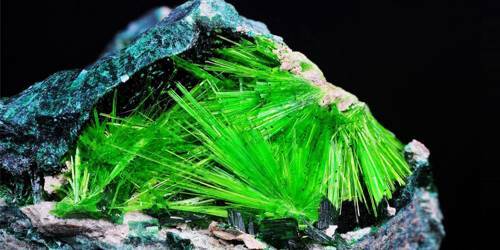 Cuprosklodowskite is a nesosilicate mineral, It is grass green to dark green in color, and its crystal habit is typically acicular, flat-bladed crystals. It is a strongly radioactive mineral. Occurrence: A secondary mineral formed by alteration of earlier uranium minerals, both in situ and after transport of solutions. It occurs in association with becquerelite, brochantite, uranophane, kasolite, vandenbrandeite, liebigite, and compreignacite. Remember, this is a radioactive mineral and should be stored away from other minerals that are affected by radioactivity and human exposure should be limited.